Morro Bay currently gets about 87 percent of its drinking water from the State Water Project, but now the city is looking to desalination and aquifer recharge to replace imported water. Instead of counting on uncertain and perhaps unreliable imported water in the future, on May 10, the Morro Bay City Council is scheduled to discuss utilizing a “diversified portfolio.” Although residents currently use about 1075 acre-feet a year, the new plan would produce 1200 acre-feet of water a year to meet growth needs. The largest portion of water would be from water reclaimed from wastewater. However, plans to build the city’s new wastewater treatment facility have been waylaid by arguments over where to locate the facility. Of the city’s planned future water supply, 1000 acre feet would come from the city’s planned water reclamation facility and 250 acre feet would come from the city’s desalination plant. The city is seeking to use its desalination plant on a permanent basis, according to a staff report. To do that, it needs the Coastal Commission’s approval. In August, the Coastal Commission is scheduled to meet in Santa Cruz and discuss the issue. In the future, the changes could save city residents on their water bills. 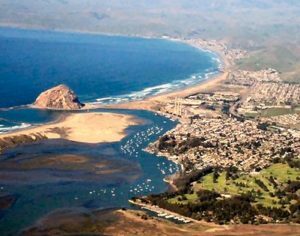 Future projections suggest state water will cost Morro Bay about $3 million a year for 1200 acre feet, while the two local sources will cost about $1 million a year. The cost of state water is expected to rise once new tunnels in the delta area are built. In addition to Morro Bay, multiple California communities are looking at developing local water sources. Santa Barbara’s desalination plant is scheduled to begin supplying nearly 3 million gallons of water per day in October. This is equivalent to 3,125 acre-feet of water annually or about 30 percent of the city’s water usage. At an additional expense, the city has the option to expand the facility, up to the permitted capacity of 10,000 acre-feet of water annually. There is also a new desalination facility in Carlsbad near San Diego that is operational. In addition, about 15 other desalination sites are being proposed throughout California. Really? gonna save residents money on our water bills? Right. Before or after the new sewer raises our rates?…If you believe that, Bill Cosby has a drink for you. We’re in debt, so according to our city manager he needs to ” find ” money. Meanwhile he keeps hiring minions to do his work, but we’re broke. The city will never reduce our water bill, never ever. The article says the City wants a “diversified portfolio” of water sources. Given that State water is NOT reliable and NOT guaranteed, this is a good move. Don’t get rid of State water, but don’t depend on it either. Morro Bay needs a good backup water supply. The complaining and fussing going on here is nothing compared to what we’d be hearing if there were a significant interruption of State Water, and residents couldn’t get the water they need – something that very nearly happened back on the Labor Day weekend of 2011 when State Water pumps failed. City staff admitted at that time that we were VERY close to not having water. Whatever you think of the current Council, diversification of the water supply is one move that does make sense. Complaints about an attempt to secure a reliable water supply, something that actually does make sense, just look like election year grandstanding.